This intensive 2-day course is specially designed to train your public speaking skills by building a real-world presentation step-by-step from start to finish. You will learn how to properly structure a speech for business meetings, technical reports or social occasions, and deliver it with eloquence and vigour. 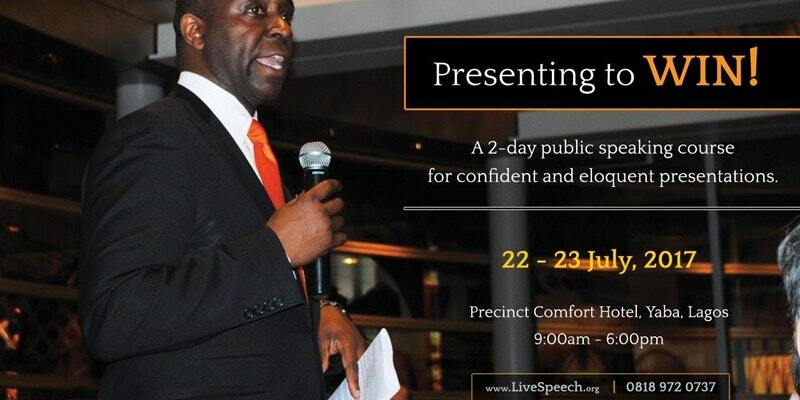 You will also learn -- with live practice -- how to generate ideas rapidly and on the spot to give an impromptu speech. All these you will perform in front of the cameras, before the group, and get instructor's feedback on your quality of performance. This is a practical training you cannot miss! • Date: 22 - 23 July, 2017 (weekend). • Time: 9:00 am - 6:00 pm (Sat); 12:00 - 6:00 pm (Sun). • Venue: Precinct Comfort Hotel, 20 Harvey Road, off Herbert Macaulay Way, Lagos. After training, you will also get one month FREE consultative support from LiveSpeech Director of Training himself, to help you out with any presentation or speech where you might need assistance. • Registration required ahead of training. • Closes once all available spaces are booked. • No registration at the venue.